3. Four-inch PVC pipe; 6 feet per column. 8. 1/2-inch black poly T’s. 14. 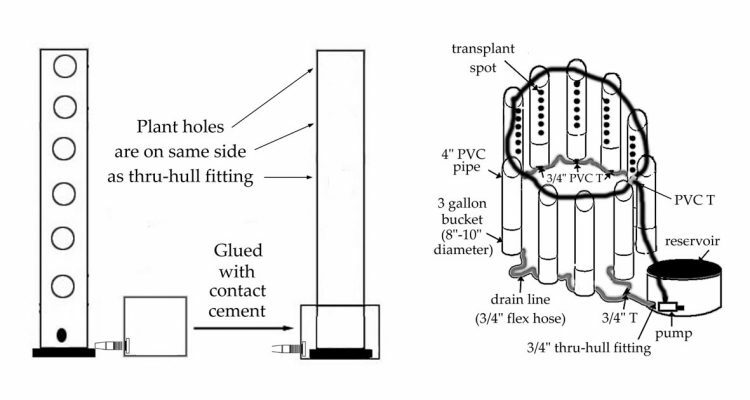 1/8-inch tubing for feeder lines (1-foot per plant). 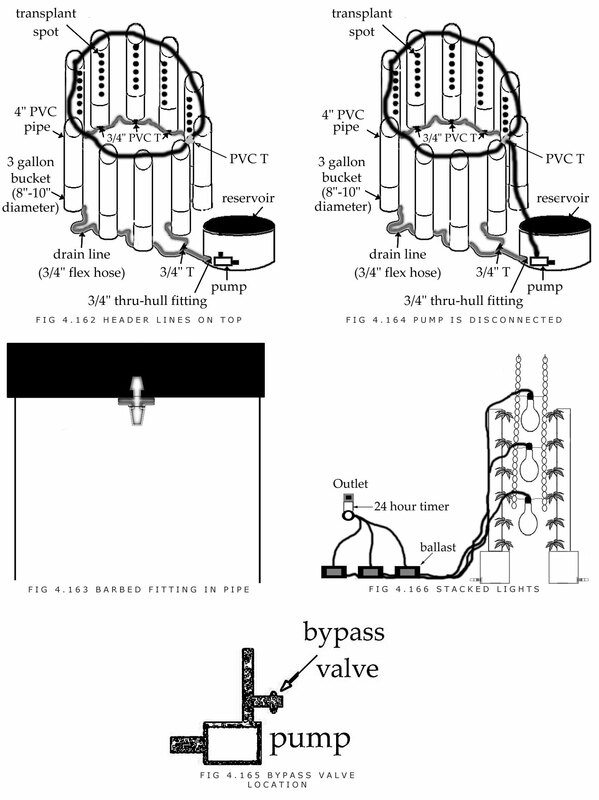 In most cases this system is used to grow small plants.Seedlings can be induced to flower at 5 weeks old, while clones can be induced to flower when they are 6 inches tall. Typical uses for this system are to set up 12 pipes at 8-inch centers or 10 pipes at 10-inch centers using two 1,000-watt lights. The pipes will be filled with a medium; anything from soilless mix to a homemade blend like 30% coco fibres / 70% perlite. With this system, the pipes can be empty so that the roots run freely down the inside of the pipes, or the pipes can be filled with a medium like soilless mix. If they have mix, feeding once a day will ensure that the medium does not dry out and plants get ample nutrition. If the pipes are empty, having the pump run for 2 minutes every 20 minutes will keep the root zone moist and with a good supply of plant food. D. Holes are drilled into the 6-foot PVC pipe at 8 to 10-inch centers with a holesaw. The holes need to be large enough for the plant and its roots. Smaller plants such as rooted clones are easier to work with. F. The support system is now built: there are two options. 2. This piece of pipe (with end caps) is glued to the bottom of a bucket with contact cement. 3. 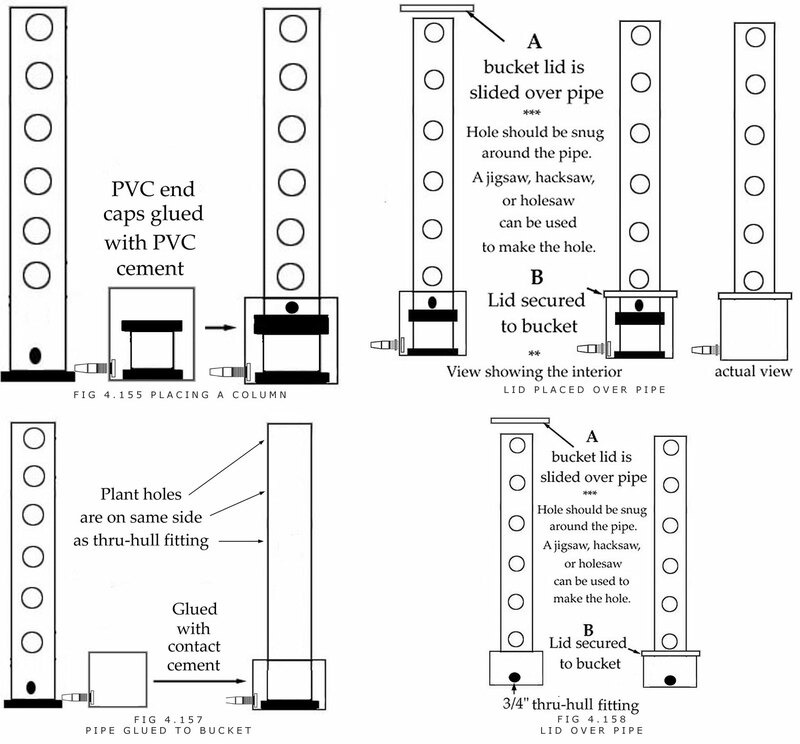 The bucket lid is placed over the pipe and secured to the bucket. The lids are placed over the tops of the pipes to give a tight fit. Holes can be cut into the center of the lids with a holesaw, jigsaw, or hacksaw. 4. Four-inch PVC pipes are filled up with medium (i.e. soilless mix) or they can be filled after the complete setup. Duct tape placed over the holes will prevent the mix from leaking. The mix should be nice and wet before the holes are exposed so that it does not fall out. 1. The end cap of the long pipe is glued to the bottom of the 3-gallon bucket with contact cement. 2. The lids are placed over the tops of the pipes to give a tight fit. Holes can be cut in the centers of the lids with a 4 1/4-inch holesaw, jigsaw, or hacksaw. 3. Four-inch PVC pipes are filled up with medium (i.e. soilless mix). This can also be done after complete setup. Duct tape placed over the holes will prevent the mix from leaking. The mix should be nice and wet before the holes are exposed. 4. 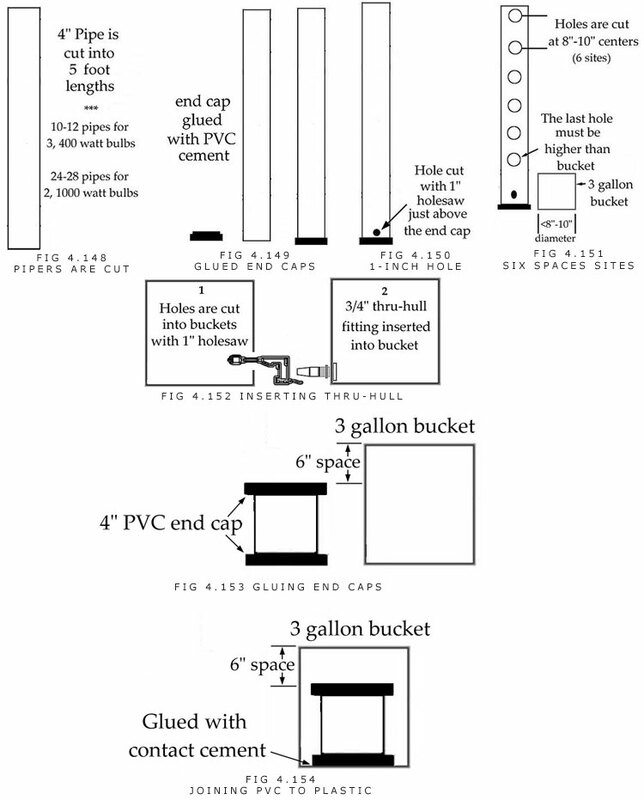 The buckets can be placed on top of cement blocks for better drainage. Option: A bypass valve can be inserted between the pump and the first 1/2-inch PVC elbow. To insert a bypass valve, a 1-inch chunk is cut out of the 1/2-inch poly line. Then a 1/2-inch PVC T is inserted into the cutout section. A 5-inch chunk of 1/2-inch poly plastic is connected to the 1/2-inch PVC T, and a lightweight plastic tap is connected to the 5-inch chunk of black poly piece. N. Lights are hung in between the plants without hoods. For example, three to four 400-watt lights (2 to 3 sodiums and 1 halide in middle) can be placed on top of each other in order to illuminate the plants grown in 6-foot high pipe.